07.11.2005, San Jose, CA; "HP Pavilion At San Jose"
Paul McCartney, slender, his hair free of gray, stepped back from the microphone. "I want to drink this in," he told the capacity crowd Monday at the HP Pavilion in San Jose, where he was making only his fourth Bay Area appearance since the final public performance of the Beatles at Candlestick Park in 1966. The crowd lavished him with love. For McCartney, who will be 64 next year, this tour is a victory lap. He held out his hand magnanimously as the audience bathed him in applause. Throughout his 2 1/2-hour, 36-song concert, he clearly relished the ecstatic reception he received. Like a victorious warrior, he hoisted his guitar above his head, brandishing it, as his face lit with delight at the waves of applause after every song. Walking onstage sporting the trademark Hofner bass from Beatlemania days and launching into "Magical Mystery Tour," he announced his intentions at the start. In the past McCartney has held his Beatles legacy at a wary distance, as if unsure how to properly deal with its overbearing presence, but tonight he was going to embrace it. From the early B-side nugget "I'll Get You" to a jubilant "I've Got a Feeling," from "Let it Be," he navigated a path through his daunting Beatles catalog that highlighted nooks and crannies without expense to the mandatory landmarks. "Hey Jude," "Yesterday," "Eleanor Rigby" and "Let It Be" were all there. But so was "Drive My Car" from the British "Rubber Soul" album. And so was "Till There Was You," the roasted chestnut from Broadway's "The Music Man" that has undoubtedly been in his repertoire since the Beatles' earliest days in Hamburg, Germany. McCartney played a number of songs by himself. He strummed his way through a few on acoustic guitar, including the always charming "I Will." He sat at the piano and doodled out "Fixing a Hole" from "Sgt. Pepper" to the abundant approval of the audience. Still at the piano, he dropped a few blues licks into "Long and Winding Road" and flashed some Professor Longhair flourishes at the start of "Hey Jude." He ripped off a little electric guitar solo, very brief, quite tasty, on "Let Me Roll It." He brushed off his own extensive solo career with a few obvious selections and four pieces from his latest album, "Chaos and Creation in the Backyard," an album some have hailed as a modest return to form. Of those four, only "Jenny Wren," sung solo on acoustic guitar, showed any sign of real character. But the concert never went more than two songs without a Beatles song. No matter what has happened in the many years since, much of the Beatles' music still sounds fresh and timeless, as if it could have been written and recorded last week. The shadow the group casts across the rock scene just seems to grow longer every year. Only McCartney can introduce a song like "I'll Follow the Sun," by remembering writing the song in the front room of his council flat in Liverpool, looking across the street through lace curtains. His connection to the music can be the most palpably moving part of his performance. His vocals could sound offhand, sometimes almost desultory. His four-piece band stuck as closely as possible to the original arrangements -- none of the tunes were opened up or tinkered with, but presented almost reverently, note for note, as if these musicians would be out of line putting their stamp on it. The keyboard player supplied cheesy horn sections for "Got to Get You Into My Life" and string parts to "Eleanor Rigby" that were straight out of a Holiday Inn lounge. And, when McCartney was not singing, the band could quickly sound pedestrian, the two generic shaggy-haired rock drones running around onstage, flailing their guitars, doing little leaps, generally happy to be in the best Beatles tribute band of them all. McCartney himself certainly cut a regal figure, waving to the crowd like a royal in a parade. As he grows older, he is not holding his audience with the dazzling nuance of the senior Sinatra, but rather a combination of sentimentality and verve. His voice may no longer be the peerless instrument it once was. He leaned on rote show-business cliches a little more than he needed (the flag-waving bit at the encores was definitely over the top, pure Wayne Newton). He may have been somewhat stilted speaking to the crowd. He may have been occasionally awkward and even a tad patronizing. He is clearly not a natural entertainer. 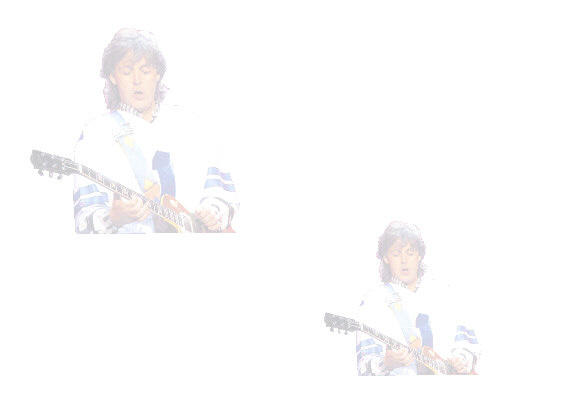 But he is Paul McCartney. And that counts for a lot. Three songs into his concert Monday (11/7) at the HP Pavilion in San Jose, Paul McCartney (tickets | music) simply stopped and decided to enjoy the moment. "I'm just going to take a moment to drink this all in," the 63-year-old singer/songwriter said as the capacity crowd's complete and utter adoration washed over him. It was another love fest for Liverpool's favorite son. He's had roughly a million of them over the years. Yet, he never gives the impression that it gets old for him. To the contrary, McCartney always comes across as quite gracious and even humble on the stage. The image he presents is that he's not all that different than the people sitting in the crowd. Of course, the people in the crowd haven't written (or co-written) a hundred or so of the best songs of the last 45 years. Maybe that figure is amazing to some readers. But the fact is he could have doubled, even tripled, that number, and there still needn't have been a clunker included in the set. The show, however, got off to a bit of a slow start. There was an ill-advised DJ set that served in place of an opening act, as well as a video segment about McCartney's many triumphs that went on far too long. The sound in this hockey arena was also quite muddy to start, but, fortunately, it cleared up a few songs into the headliner's set. McCartney came out firing with a pumped-up version of "Magical Mystery Tour" and then coasted through the likes of "Flaming Pie" and "Jet." The well-oiled, five-piece McCartney band then shifted into high gear after eight songs, and it was all high fives and squeals from the crowd from that point forward as the group delivered solid versions of "Maybe I'm Amazed," "The Long and Winding Road" and "I Will." Although, as one would expect, McCartney always boasts a stellar touring band, some of the finest moments of his recent shows have come during his solo-acoustic interludes. That was again the case on this night as the singer parted with his band and crooned through warm versions of the Beatles classic "Fixing a Hole," the new song "Jenny Wren" (from the recently released "Chaos and Creation in the Backyard") and the relative obscurity "In Spite of All the Danger" (a pre-Beatles Quarrymen demo that featured McCartney, John Lennon and George Harrison). He then called back his fellow musicians and led them through stripped-down versions of "Blackbird," "I'll Follow the Sun," "Eleanor Rigby" and "Follow Me" (another selection from "Chaos and Creation in the Backyard"). Plugging back in, McCartney changed direction and rocked out such up-tempo tracks as "She Came in Through the Bathroom Window," "Good Day Sunshine" and "Band on the Run." The main set concluded with a delicious double shot of "Hey Jude" and "Live and Let Die." What some are calling "the biggest week in Bay Area rock 'n' roll history" got off to a fine start when Paul McCartney played the first of two nights at the HP Pavilion in San Jose on Monday. In fact, Sir Paul set the bar so high that the other two legendary artists coming through town this week — U2 and the Rolling Stones — might have trouble clearing it. Of course, you might find this critic singing an entirely different tune when you pick up the paper tomorrow and read my review of U2's show on Tuesday at the Oakland Arena. Still, as great as U2 is every time the band plays, and as good as the Rolling Stones can be on occasion, it will be hard for either to top the type of numbers that the former Beatle posted at the home of the Sharks. The most significant number was 37. That's how many songs he played. And, more significantly, that's how many good songs he played. But McCartney — who finally turns 64 in 2006 — certainly made the crowd wait to get to the nuggets. The show began with an annoying set by a DJ — a misguided and wholly unnecessary attempt by McCartney to come across as hip and cool, which proved vastly unpopular with the audience. If anything, the set further helped convince these folks that DJ tunes are to live music what bowling is to sports. When the house lights finally went down, and the crowd finally lit up, it was unclear whether the enthusiasm was for anticipating McCartney's entrance or gratitude for the DJ's exit. Yet instead of fanning the crowd's flame, McCartney further doused it with an extended video segment about his life that seemed to go on forever. Fortunately, just before we got to the part about what kind of cake he had on his seventh birthday, the video came to a conclusion. In all, the opening segment did exactly the opposite of what it was supposed to do: It made the crowd members less excited about seeing the Wings man than when they first walked in the joint. Likewise, McCartney and his four-piece band were a bit lackluster during the first portion of the show. They opened with a strong version of the Beatles' "Magical Mystery Tour," but then followed by mailing in lukewarm renditions of the title track of the 1997 solo effort "Flamming Pie" and Wings' "Jet," off 1973's "Band on the Run." Things heated up a bit as the band mixed crowd pleasers ("Drive My Car," "Got to Get You Into My Life"), lesser-known numbers (the early B-side "I'll Get You," the Broadway-gem "Till There Was You") and even one new song ("Fine Line," from the new "Chaos and Creation in the Backyard"). Then, eight songs into it, McCartney somehow shifted the show into a higher gear, in the same way that all the truly great ones do, and, at the piano, performed a mesmerizing version of "Maybe I'm Amazed" (from 1970's "McCartney"). From that point, there was simply no stopping the Cute One as he followed with a gorgeous rendition of the teary Fab Four classic "The Long and Winding Road" and the obscurity "In Spite of All the Danger." It was a real treat to hear "In Spite of All the Danger," a pre-Beatles demo McCartney recorded with George Harrison and John Lennon as part of the Quarrymen. Yet it was hard stay in the moment as the singer performed "In Spite of All the Danger" and other numbers in the solo acoustic format. Instead, everyone in attendance seemed to be anticipating what McCartney solo acoustic usually means: "Blackbird." The rock star made the crowd wait before taking "Blackbird" out of its cage. He first delivered warm versions of the classics "I Will" and "Fixing a Hole" and the new songs "Jenny Wren" and "English Tea." The band joined back in, albeit in a stripped-down fashion, for a bright rendition of "I'll Follow the Sun" and a solid take on the new tune "Follow Me." Then, finally, McCartney swooped in for the kill with a precious, hushed version of "Blackbird" that gave way to an elegant run through "Eleanor Rigby." The intensity picked up for the last third of the concert as McCartney and crew jammed through the surefire crowd pleasers "She Came in Through the Bathroom Window," "Good Day Sunshine" and "Band on the Run." The main set came to a satisfying conclusion with the sing-along classic "Hey Jude" and the fireworks-aided "Live and Let Die." McCartney could have let it end right there. Instead, he returned to the stage for two generous encores, which included a particularly fiery version of "Helter Skelter." When it was all said and done, McCartney had thrilled this audience with more than three hours of some of the best music of all time. Top that Bono and Mick. Among the pantheon of 1960s rock gods that defined the era, McCartney alone seems to have emerged from the other side of the tunnel with the spirit that drove him to pick up the guitar in the first place wholly intact. While his fellow ’60s icons are now either dead, warped by celebrity worship, haunted by their own history, brazenly cynical (Yeah, we’re talking about you, Mr. Jagger) or otherwise diminished, Sir Paul has somehow held on to his sincerity, his exuberance and his love for the magic of sharing music with a live audience, despite the fact that he’s had a bumpier ride than most. During back-to-back sold-out shows at the HP Pavilion in San Jose Monday and Tuesday, McCartney fanned the eternal glow of Beatles devotion with an almost three-hour show, characterized by a degree of mutual regard between performer and audience rare in live concerts. In other words, McCartney proved he’s the most un-rock-star of rock stars, intent of showing his gratitude to his audience, whatever it might cost him in cool points. Early on in the show, McCartney stopped to ask the audience’s indulgence: “I want to take a moment just to soak it all in.” At that, he walked to the edge of the stage and let his gaze wander throughout the packed arena, like a kid looking into a toy store window. A smarmy stunt? Maybe. But if it was, McCartney was unashamed to go to the well again and again. After almost every song, he waved and bowed to the crowd in a show of appreciation that came across as genuine, a man counting his blessings. (Though, after the first encore, Macca slipped into pandering when he came out carrying the Stars and Stripes). As for the music, McCartney has a new album to hawk (“Chaos and Creation in the Backyard”) but played only a few selections from it, instead leaning heavily on Beatles standards from “Good Day Sunshine” to “Hey Jude” to “Helter Skelter.” Surprisingly, though, he got up his best head of steam doing Wings standards, particularly “Live and Let Die,” augmented with a sound-and-light punch to the gut. McCartney barrelled through his set list without a break, a four-piece band of players all too young to remember the Beatles behind him. There was a certain business-like efficiency to the playing and McCartney’s between-song banter seemed a tad programmed, but fans learned the origin of the elegant guitar line in the masterpiece “Blackbird” (Hint: Listen to J.S. Bach). Macca wrapped his arms around his entire career, performing the old “Music Man” ballad “Til There Was You” and reminiscing about that song’s place in the earliest days of what became the Beatles. He jumped into “Please Please Me,” evoking the bubbly charm of Beatlemania-era Paul. From “Magical Mystery Tour,” which opened the show, to a medley of “Sgt. Pepper’s Lonely Hearts Club Band” and “The End” that closed the final encore, McCartney was keenly aware of the audience’s thirst for Beatles classics and indulged them at every opportunity. It’s easier to recall the McCartney-penned Beatles songs that he didn’t play — “Lady Madonna,” “Rocky Racoon” — than those he did perform. As McCartney lingered on stage after three hours, he reached over to sign a few items tossed onto the stage, eventually pulling himself away to a thunderous ovation. Rock scenesters who’ve always distrusted McCartney’s thoroughly mainstream give-the-audience-what-it-wants attitude were likely to be turned off by the show’s smoochfest vibe. But when the audience and the performer want the same thing — just to inhabit the evocative pleasure of beloved old songs — it can be a magical moment. With so many great songs from which to choose, it's pretty hard for Paul McCartney to stray off his long and winding road. But too much of the former Beatle's 2 1/2-hour set Monday at San Jose's HP Pavilion sputtered and wheezed around the curves, smoldering without catching fire. With a few simple changes to the set list, he could have saved it and made it as good as 2002's excellent ``Driving Rain'' tour. From the beginning, he took a couple of wrong turns. His first song, a blazing ``Magical Mystery Tour,'' got the crowd onto its feet. But the tuneless ``Flaming Pie'' had the entire crowd back in its seats. Note to Sir Paul: Unless you are playing at a nursing home, you are doing something very wrong if a rock 'n' roll crowd is sitting during the second song. Maybe it's unfair to compare the often tender McCartney to rockers like the Stones or Bruce Springsteen, but McCartney paled even compared to his last tour, which had people up and dancing for most of the show. This time he took a wrong turn even before he came on stage. The opener, DJ Freelance Hellraiser, played mashups of McCartney songs and was booed. And why show a 10-minute biopic of the man that the Guinness Book of World Records has called the top-selling pop artist ever to fans who plunked down $200 for a good seat? The biggest problem was the pacing. The band stopped after every song while McCartney or another band member talked. Such intimacy works fine during acoustic or slower songs, but it killed the momentum for those who remember how to rock. There were still plenty of highlights, and most people seemed happy with the show. My favorites included a tasty version of ``Fixing a Hole,'' with McCartney exploring jazzy possibilities on grand piano. The soft and haunting ``For No One'' was a treat in 1966 and just as beautiful now. ``Helter Skelter'' and ``Good Day Sunshine'' were welcome rockers toward the end and would have greatly helped the opening set. McCartney and crew played well throughout. His voice remains as strong as 40 years ago. Rusty Anderson and Brian Ray on guitars, Paul ``Wix'' Wickens on keyboards and assorted instruments hit great harmonies and caught the right mood in every song. Dynamic drummer Abe Laboriel Jr. cuts through with his personality and backup vocals. When they rocked on ``Sgt. Pepper's (reprise)'' and ``The End,'' this was the best Beatles cover band in the world. There were no silly love songs. If he had just kept the rockers together and kept the place on its feet, there might have been nothing silly about the whole show. Or maybe McCartney's fans prefer to sit and listen for most of the night. But then, why play at a hockey arena?